Samsung’s QuickDrive™ range of washing machines were launched to rival the very best their competitors have to offer. I got to grips with the Samsung WW90M6450PO, the 9kg AddWash machine from the QuickDrive range. Just from first impressions of the machine’s look you know you’re dealing with technology far more advanced than your average washer. Their machines have retained the basic touch-control fascia whilst replacing their plastic dial with an oversized stainless effect one. Everything on the panel has the ability to be customised; from the number of extra rinses to turning on the bubble soak option and of course there is the infamous Samsung jingle. Inside the machine, Samsung have tweaked their drum design slightly, moving away from the diamond design on last year’s AddWash range and incorporating something more akin to a teardrop design. The main drum feature is what you can’t see though; the machine’s dual drum technology is what puts the QuickDrive into practice, reducing washing times by up to 50%. Whilst the inner drum is rotating away, you can’t see the outer drum working just as hard spinning in the opposite direction. This mode is the answer for anyone who cannot stand those A+++ rated machines that take two and a half hours for a cotton wash. Regarding the cycles, Samsung continue to be renowned for having one of the most versatile selections of cycle choices available. The tried and tested go-to programmes “Cotton”, “Synthetic” and “Delicate” programmes sit proudly at the 1 to 3 o’clock points, but further round you’ll see options for the likes of a dedicated bedding setting, or wool. There is also option for “Outdoor Care”, an intensive wash for those who get hands-on in their trades, yet still want their clothing to retain the original colours and texture and not feel like you’re wearing a cardboard box in the freezing cold. Samsung’s trademarked Eco Bubble mode also continues to be a big hit with customers and with the sleek new drum design this is a further improvement on previous models. The same can be said for the “Add Wash” feature that, practicalities aside, keeps Samsung firmly at the top as one of the leading laundry and electrical pioneers. The AddWash feature allows you to open the innovative AddWash™ door to quickly drop in anything extra during the wash (at 50 degrees) – whether it’s THAT missing sock, the forgotten softener, or a delicate hand-washed garment for final rinsing, Add Wash™ comes to the rescue. 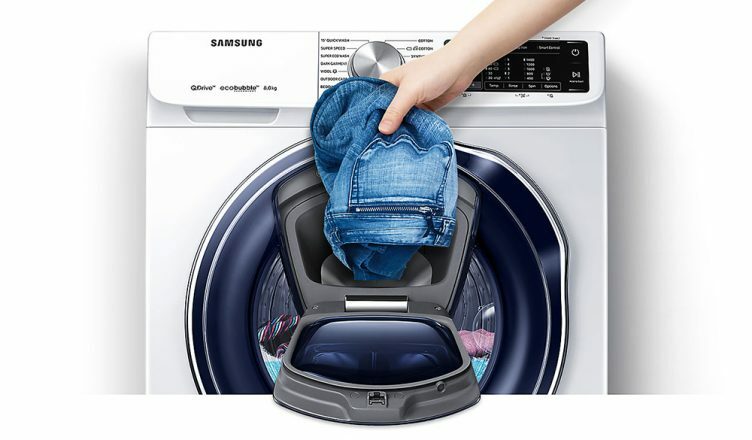 For those people who are always on the go, Samsung have now added their washing machine range to their Connect app meaning you can control and maintain your appliance on the go via Wi-Fi. Forgot to set the time delay? No problem! Whilst you’re sitting on a packed bus or train, heading to work, a few swipes on your ‘phone sets it up ready for when you come home. For those of you who like your washing ready for when you get up in the morning, Samsung’s Vibration Reduction Technology ensures that when your machine hits 1400rpm for its spin cycle, you won’t be disturbed during the night. Samsung’s understandable belief in their own technology and all their Quick Drive machines has presumably been the driver behind them offering a manufacturer’ 5 year parts and labour guarantee, which is redeemed online through Samsung’s website. The 10kg, 8 Series machine comes with a whopping 11 year guarantee to rival the very best of the rest. All the QuickDrive ranges have Samsung’s Eco Drum Clean option for maintaining your machine. Water is directly driven into the drum to remove any residual water and detergent left from doing cool washes, even the rub seal gets a scrub to ensure no bacteria is able to grow and produce mould. You’ll even be prompted by your appliance to do this every so often, so there is no need to mark the calendar or set up reminders. Buy this Samsung WW90M645OPO washing machine online, use our Click & Collect service to pick one up in as little as one hour or, for more information, call or email us or visit your local store. Our team can also advise on spreading the cost of your purchase with one of our finance options.